For some time there was no straightforward way to get the URLs of photos in Windows Live SkyDrive albums. 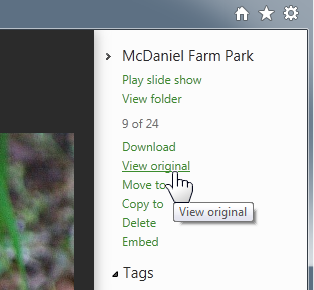 With the recent update (November 2011) there is now easy access to the original photos stored in SkyDrive. The information pane for a photo now contains a “View original” link. So with just one click the browser goes to and displays the original. The URL can be easily copied from the browser address bar. SkyDrive web addresses, URLs, are incredibly long, typically more than 140 characters. No way can you write those done, so just copy the URL with Ctrl+C and then paste it to the destination with Ctrl+V. This works just fine with the Live Writer Insert – Picture tool. 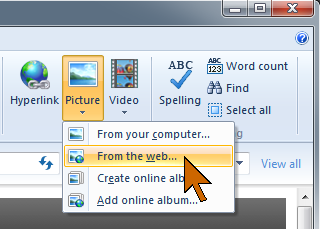 Click From the web… to open the Insert Web Image dialog. 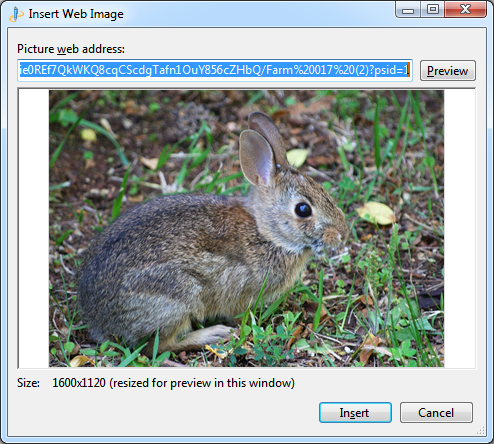 The photo is previewed in the dialog window. Click Insert to place it into your post. The image will be inserted in full size and most likely overflow the blog margins and the Live Writer window. In the Size group of the Picture Tools ribbon click Lock aspect ratio, then you can resize the image to fit as you like. Remember you can replace the size value to obtain a custom size, you are not limited to the presets of Small, Medium, or Large. If you forget to click Lock aspect ratio the resized image will be stretched or squashed, just redo the operation. By default, for an imported web image, the Link to: setting will be None. If you wish to link to the actual image in SkyDrive or to another web address, click the down arrowhead next to the option, then select Web address… the Insert Hyperlink dialog opens. You will need to paste the URL of the image or whatever you want to link to. Be sure to fill in the Title: field. If you don’t see the field, click Advanced. The text in the Title: field will be shown in a text balloon when a viewer hovers the pointer on the image in your post. If you wish to link to the image in your album as shown in SkyDrive, use the image address for this photo, do not get and insert the Embed code (offered in the information pane). The embed code is an “iframe” set that is stripped out by WordPress for wordpress.com blogs. It can be used on webpages and self-hosted blogs. But that is really another topic. 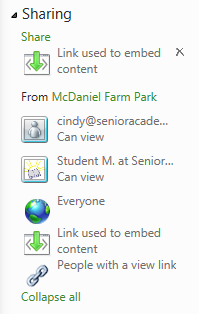 One note of caution: The SkyDrive sharing system has been extensively revised. The prior settings have been “grand-fathered” in. I urge you to carefully learn the new approach to sharing. Files and photos take the share setting of the containing folder (or album), they can also be shared individually. For sharing images in a public blog, be sure that the image sharing is set to Everyone, either for the photo or for the containing folder. As you can see in the illustration at the right, the new, simpler system is anything but. Sharing is sure to cause a lot of confusion and there are bound to be changes soon. Below find RSS and email subscription links.